1. On the menu bar, click View > Processing. 2. On the processing bar at the bottom, check the three boxes for all steps. For more information: Menu View > Processing . Information: Processing on the Cloud will start with Step 1 if Step 1 has not been processed on the Cloud yet. If some edits need to be done on the point cloud, after the processing on the Cloud has finished, download the point cloud and open it locally to edit it, then replace the point cloud previously generated on the cloud with the edited one from the cloud interface: click FILES and in the corresponding Point Cloud box, REPLACE FILE. 4. In the File Upload window, check the box Start Processing. 5. Ensure that the preferred solution is selected. Click here below the Progress bar. For more information: How to select a preferred solution. 7. An email is sent shortly to inform of the project status. Tip: You can easily share your project on Pix4D Cloud with anyone. You can modify your project's processing options before uploading the project to Pix4D Cloud. For more information: What are the templates and processing options applied on the cloud?. For advanced outputs and editing, process the project locally following: Getting Started Index. Important: If you upload your project for technical support, let your Pix4D Support point of contact know when your project's name when it is available on Pix4D Cloud. I do exactly as it is mentioned above but my project went to Pix4dmodel not on Pix4dmapper, i want to upload my project to Pix4dmapper, how will i do it???? Thanks Rohit for your feedback. We have updated the article to add this information (see Step 5). after step 6. the progress still at 0% and can not upload anything. "[Error]: Error e9034: Problem uploading item to the cloud." Hi Phosai. Can you create a project from scratch on the cloud by uploading the images directly? This will test if it is a network issue. If you can then please recreate the project from scratch to see if that allows you to upload. If it still doesn't work then please consider opening a support request on the home screen linked below. Please attach the log file and .p4d file so we can take a closer look. i can create a project&upload on the cloud directly, it works fine. but i think maybe my problem is internet connection issues because i try a new connection today the progress increase to 30% (and fail ) so i think the internet not good enough. - Special characters in the image pathname. In this case, please remove the special character, open the p4d locally, save the project re-upload to the Cloud. - A firewall is blocking the upload. In this case, deactivate it. - Try to connect to the Internet with a Lan cable directly, rather than with the wifi if possible. I am doing all the processing on the Desktop. Then I am trying to export all project files the Cloud "as is". I do not want to "Start processing" on the cloud because the job has been done already on my laptop and I don't want to "consume" my credit of 2,500 pictures on the cloud. (So that I uncheck the "start processing" box). What does that mean? Why cant we export the Orthomosaic etc.. 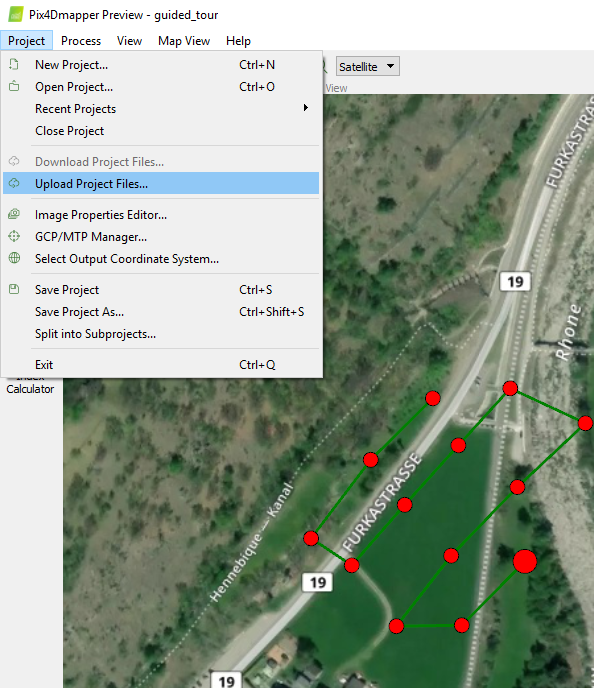 It is possible to only upload the results generated in Pix4Dmapper without reprocessing the project. To do so, I recommend checking the instructions in How to upload results and outputs to the cloud article. - The Upload of other files than images is limited to only Orthomosaic, DSM, Point Cloud and Mesh. For example, the report cannot be exported from Desktop to Cloud, true? Do I have to wait for some time after the upload to visualize say, the Orthomosaic? Uploading the Project Files from the desktop application without starting processing will upload to the Cloud the images and the project (.p4d) file only. This option is available for users that want to start the processing at a later stage. If you want to upload only the results, please create a new project from the Cloud page and upload the results from the interface, as explained by Blaž. To answer your second question, the Quality Report, together with other additional outputs, are generated only when the project is processed on the Cloud. To check the list of downloadables after processing, see the article How to download results from the cloud. If the processing is not run on the Cloud, the results that can be uploaded are the DSM, the orthomosaic, the Point Cloud and the Mesh, as you said. I will take care of making the procedure of downloading/uploading clearer in our articles. If there is still something which is not explained well from your point of view, feel free to let me know so that we can improve it. Thank you very much for your answers, and we are really progressing a lot. However and for some reason ?? the cloud and mesh layers are not "stable": immediately after download the mesh is visible, but we cannot make measurement (it's like no point cloud behind). Then if we reload the point cloud, it will appear but there is no way to have the mesh again. I see your problem. I forgot to mention that the Mesh generated by Pix4Dmapper is not georeferenced, while the Point Cloud is. Since they are placed in the same viewer, it looks like they cannot cohabitate. But if you replace the Mesh files uploading the .obj, .jpg, .mtl and .xyz files (you can find this last one in the \1_initial\params folder) in the 3D mesh box, the uploaded mesh should be properly georeferenced and aligned with your point cloud. It is important that all the 4 files are uploaded at the same time or at least the offset file is uploaded first and the 3 files for the mesh are uploaded later, so I suggest that you copy them in a single folder and then drag and drop them in the project's files section for uploading. Let me know if all works then. Now I can re-work my project and then re-export them. Amazing!